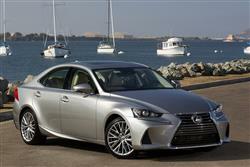 Find out everything you need to know on the new Lexus Is from independent vehicle review website Car And Driving. You can watch the video review to the left to see more of the car or read their written review below to get a true insight from an expert in the automotive industry. The hybrid Lexus IS 300h Executive Edition serves to remind us that there is civilised life beyond the BMW 3 Series. Jonathan Crouch reports. The Lexus IS 300h Executive Edition builds on the long specification list of the Luxury model, adding satellite navigation and leather upholstery. That means that for £31k, you're getting a car with a huge spec list, 223bhp worth of power output, 101g/km emissions and 65.7mpg economy. That's hard to better. Imagine you've landed a new job, you've wangled a new Macbook Pro on expenses, figured out where the best coffee is to be had and an email from the firm's fleet manager pings into your inbox letting you know you've got a £31k company car allowance. Like most people, your first port of call will be BMW's website. You quickly realise that the Plug-in Hybrid 330e model is well out of budget and that your allowance will only stretch to an unspectacular 318d in workaday SE trim. You're not prepared for life with just 150bhp under your right boot. Mercedes' price list isn't any more encouraging. Here you can only afford the base model C Class. Audi? A bit less depressing; here you can get a 190PS A4 2.0 TDI. What about Lexus? It's a long shot but worth a look. For £31,000, you can get yourself a hybrid Lexus IS 300h Executive Edition with leather, satellite navigation and a combined 223bhp power output. Lower emissions than all the others, more gear and much more power. What's not to like? With over 50 per cent of the compact executive market being diesel powered and that figure growing year on year, diving straight in with no diesels on offer in the IS range would appear to be an act of the grossest folly but the IS 300h is Lexus' preferred alternative to a diesel. It makes decent numbers. Between its 178bhp 2.5-litre four-cylinder petrol engine and its 105kW electric motor, you end up with a peak power figure of 223bhp. The engine benefits from a D-4S fuel injection system, Dual VVT-i intelligent variable valve timing and a high-efficiency exhaust gas recirculation system for maximum power and efficiency and the rear wheels are driven through the hybrid powertrain's E-CVT transmission. It'll get to 62mph in 8.3 seconds and run onto a 125mph top speed. The suspension and steering have been revised to improve how the IS drives, and there's a new Drive Mode Select system that allows the driver to choose between Eco, Normal and Sport modes the latter sharpening throttle response and offering a sportier steering setting. With a petrol-powered car you enjoy quieter running, no clatter on start up, quicker defrosting in winter and cleaner refuelling. Changes to this improved third generation IS are subtle but significant. Buyers get restyled headlamps, larger and deeper air intakes integrated in the bumper and a further evolution of the signature Lexus spindle grille. In profile, the character line along the side of the car has been made stronger and at the rear, chrome detailing has been added to the lower bumper panel. The rear lights have also been redesigned, with LED lamps and smarter light guides that create an L-shape motif. Inside, the high-resolution multi-information screen that accompanies the Lexus Premium Navigation system has been increased from seven to 10.25 inches, presenting larger, clearer images and providing a split-screen function so that different information displays can be presented at the same time. Changes have also been made to the steering wheel (matching the design of that in the Lexus RC coupe) and the driver and front passenger knee pads now run the full length of the centre console. There are also new cupholders, a satin finish for the gear lever, a larger, leather-wrapped and stitched palm rest for the Remote Touch Interface control, and classier dial markings on the analogue clock. Otherwise, things are much as they were before, which means a classy cabin with best-in-class standards of kneeroom at the back. And the boot? Well the batteries that must be housed beneath its floor in the hybrid IS 300h model rob you of 30-litres of space, but that still leaves a class-competitive 450-litres of room on offer. And, as long as you avoid entry-level trim, there's a 60/40 split-folding rear seat for those times when you want to avoid the home delivery charge after a trip to IKEA. The Executive Edition is based on the Luxury trim level but delivers a £31,000 asking price that'll save you £3,500 over that variant. It includes a full leather interior and Lexus Navigation as standard. These extras are two of the most requested options by Lexus IS customers. Aside from these refinements, you also get the Drive mode select system (Normal, Eco & Sport - additional EV mode on IS 300h), cruise control, smart entry and start system, dual zone air climate control and power-fold heated mirrors. Then there are HID headlights with dusk sensing, eight airbags, DAB digital radio and Bluetooth connectivity. Standard is the 'Lexus Safety System+' portfolio of advanced safety systems. Its features make use of camera and radar sensors to support the driver with improved information, better forward vision and prompt warnings of hazards and collision risks. Plus there's an added layer of protection in the form of autonomous braking for emergency situations. The IS benefits from a Pre-Crash Safety system with pre-crash brake assist and pre-crash braking, Adaptive Cruise Control, Automatic High Beam, Lane Departure Alert and Traffic Sign Recognition. There's also a 'Sway Warning' system. This monitors the vehicle's lane position and driver steering inputs, detecting any sway (deviations) that might be due to the driver losing concentration through tiredness or distraction. In such circumstances, the set-up will sound a buzzer and trigger a warning light in the multi-information display. A small word of warning is perhaps due when looking at the Lexus IS 300h Executive Edition. You may well have seen advertisements for the IS 300h trumpeting its sub-100g/km emissions. Unfortunately the IS 300h can only dip under the 100g/km barrier if it's fitted with the lightweight 16-inch wheels of the entry-level car. Step up to the bigger wheels and extra weight of the Executive SE model and emissions edge up to 101g/km which has a number of significant cost repercussions. Nevertheless, it's better than many of the diesel cars from the big German trio, so it's churlish to complain. That figure translates to fuel economy of 65.7mpg and yes, the IS can be driven in a full electric mode if you want ultimate smoothness and a handy ability to terrify dozy pedestrians. Residual values of the IS have always been good, propped up by the models brilliant reliability and customer satisfaction metrics, as well as modest insurance ratings. This model looks set to continue that form line. You might well be unconvinced by Lexus' attempts to sell us hybrids as opposed to the turbodiesels we find ourselves wedded to in the UK. In that case you need to try the IS 300h. It's entirely convincing. Not only is it as quick as its diesel rivals, it's smoother, it'll likely prove more reliable, fuel consumption is much on a par and emissions are usually quite a lot lower. This Executive Edition model is a welcome inclusion to the range, offering a full leather interior and satellite navigation for around £31,000. The biggest challenge facing Lexus will be to get bums on seats. Just breaking through that initial preference for a German badge takes some doing but if buyers can see beyond the marketing efforts of Mercedes, Audi and BMW, they'll find an entirely credible rival. As a nation we've always prized a certain independence of thought. Maybe it's time to exercise the grey matter a little harder when choosing your next compact executive car.